As I am new to Android Studio I have one question to ask here and I hope You guys don't mind. In my main activity I am able to see menu but I am not able to see title and 3 doots. I posted this problem in Stack Overflow first, but that community is more for finding typos than helping with problem and I am not even sure why I am still posting there. Have you tried the same project with different versions of Android and did you get the same result? Which version(s) have you noticed behave this way? Are you able to try on a physical devices? If so what version Android are they using? Are you following along with a tutorial which you've found online? If so please share the URL so that we can put this follow along and see it in it's original context. Please share your Gradle files as well as these contain dependencies and you may have chosen an incorrect version/dependency. Thank You on Your answer. I tried on 2 virtual devices - Google NEXUS 5X API 28 and PIXEL 2 API 23. I also tried with 2 real devices, one with Android version 6.0 and one with 7.0. I don't think that they have physical button for menu as some people state that it might be problem, I also tried to bypass that. Following along, I was able to get this to work for an API 22 device. I'm now downloading API 28 so that I can try it out. Pete Letkeman wrote: Following along, I was able to get this to work for an API 22 device. What have You done to get it work on API 22? Do You want me to share source in PM if that would be easier for You? I'll post a GitHub link after I'm able to get it to work with API 28 and then maybe we can find out what the issue is. I was able to get the solution to work with API 26. Appear to be experiencing some issues with API 28, downloading API 27 right now, however I suspect it will work. In the mean time, is there a reason that you are trying API 28 and would you be okay with the app working with API 26 or API 27? Also, are you using the newest version of Android Studio and are you SDK images up to date? Pete Letkeman wrote: I was able to get the solution to work with API 26. Appear to be experiencing some issues with API 28, downloading API 27 right now, however I suspect it will work. Sorry to ask this but I am new and this might sound stupid question. I think my SDK is up to date, but I have to check it, I guess I run Android Manager? 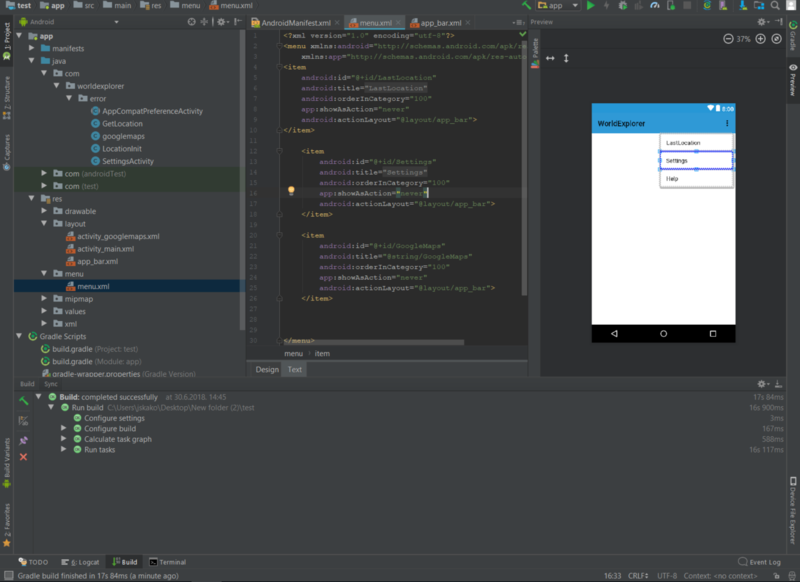 Yeah, I am using Android Studio 3.1.3. Yes, it does appear as though you are using API 25, which should run fine with new APIs. 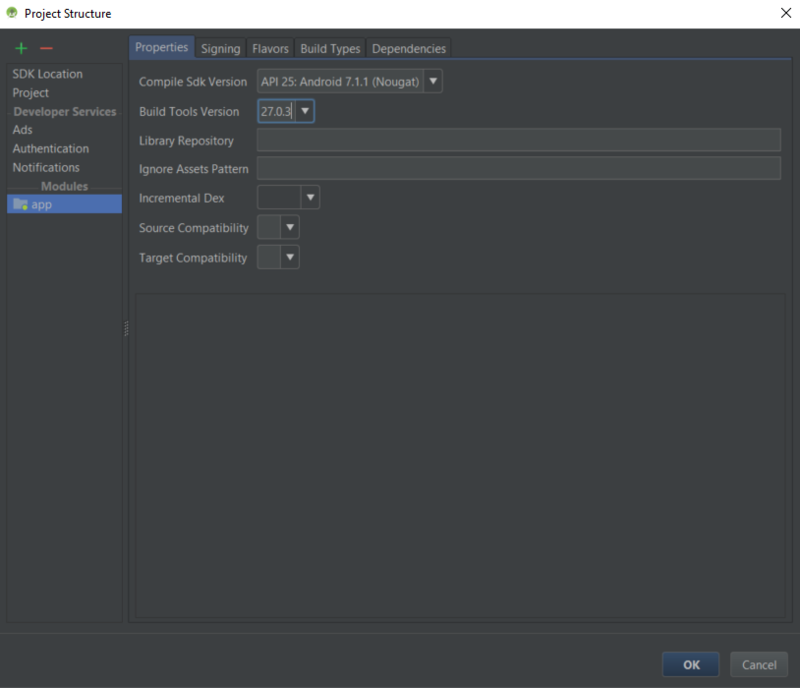 You can update the SDK using the SDK manager inside of Android Studio. Pete Letkeman wrote: Yes, it does appear as though you are using API 25, which should run fine with new APIs. Ah don't worry about it. I am on this problem since 04:00 and now is 20:50, thinking about burn PC and go outsite. Whatever I do I can't get action bar to work. Anyway I tried your application and it indeed work. But I am not sure how can I get it to work in mine. You are welcome for the sample. Unfortunately minutes ago my house lost power. But as soon I get power again I'll look into your code. You don't have to worry about the test stuff yet as you are just beginning your learning journey. Pete Letkeman wrote: You are welcome for the sample. Unfortunately minutes ago my house lost power. But as soon I get power again I'll look into your code. You don't have to worry about the test stuff yet as you are just beginning your learning journey. Ah, I can't express how grateful I am to You. Is there a way that there is a problem in layouts? But I doubt as I see app-bar background. One thing that you can try it replacing the 24.5 values to the same as the 26.1 values in your gradle files. However keep track of were those 25s are just in case you need to revert back to them. Pete Letkeman wrote: One thing that you can try it replacing the 24.5 values to the same as the 26.1 values in your gradle files. However keep track of were those 25s are just in case you need to revert back to them. I suggest that you post the project as a whole to GitHub or some place similar then post a link back here do that when someone or me try the project out locally on their system. I do have power again, but now internet connection is down so I'm just using my cell. Pete Letkeman wrote: I suggest that you post the project as a whole to GitHub or some place similar then post a link back here do that when someone or me try the project out locally on their system. I do have power again, but now internet connection is down so I'm just using my cell. Well I am not able to post it on GIT as I am working for someone and plagiarism checker might detect it on GIT. Working on it. In the mean time have you noticed that there are a number of warning in Gradle about things being deprecated? You may want to update these before too long as they could be a problem later on. Unfortunately it does not look like I'll be able to help you out with this as I'm not too sure what exactly is going on. After looking at the code I do have a few ideas as to how it can be improved upon to make it easier to follow for those who are working with the code. While this would help I think that there are still some lines which may need to be remove/rewritten to work with the action bar. If you want I can provide those hints/ideas. Did you want these ideas? Pete Letkeman wrote: Unfortunately it does not look like I'll be able to help you out with this as I'm not too sure what exactly is going on. Sorry that I didn't answer you sooner, I was on out of town for a while. Anyway, Thank You that You take Your free time and try everything to help me, if I find out why I couldn't call action bar I'll post it here. I'll try to start fresh project and make something more usefull, as this was my first app in Android Studio. if i used intent to go another activity does first activity killed?